Welcome to a series of stories celebrating SIU’s 150th anniversary. CARBONDALE, Ill. – Braden Drake had been paying his own way through Southern Illinois University Carbondale, so learning he was one of this year’s James B. and Rosemary Samuel Childress Scholarship recipients was quite a relief. Drake, a 2018 accounting graduate from Carterville, said the scholarship was a big help in paying tuition, fees, books, apartment expenses, medical and vehicle insurance bills and other costs of living. 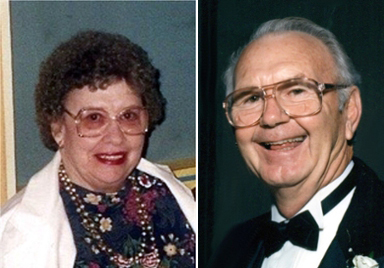 He was also excited to learn that upon their deaths, the Carterville couple added a $2 million bequest to SIU’s scholarship fund bearing their names, allowing students to benefit even more from the scholarships in the future. James and Rosemary “Dee” Childress married as high school sweethearts before James went off to serve as an electrician’s mate with the U.S. Navy in the South Pacific during World War II. He returned to his hometown, graduated from Carterville High School and then earned his bachelor’s degree in economics at Southern Illinois University Carbondale. The couple lived in a small second-story apartment, and he worked at the Carterville Post Office to put himself through school. While their married life began with meager means, James became a successful businessman. Over the course of his career, he went on to own or co-own various steel erection, construction and sales businesses as well as motels and nursing homes in the Midwest and south, according to Robert Howerton, a relative of the couple who served as their attorney. Hard work and wise investing grew the Childress fortune, Howerton said. Thus, the Childress’ philanthropy included SIU. The couple originally endowed a scholarship at James’ college alma mater in August 1989, earmarking the funds to go each year to SIU business students who are graduates of high schools in Jackson or Williamson counties or to students who graduated from community colleges and high schools within those counties. Financial need is considered and preference goes to students who are working to help cover their college expenses. Applicants must also submit an essay. Recipients are eligible to apply for a scholarship renewal. Dee Childress passed away in July 2015 and her husband died the following May. Both were 90 at the times of their deaths, and they had given untold amounts through the years to charitable causes, particularly education, civic, health, historical and relief organizations. Their final wish was to offer a helping hand to even more young people, so they added a $2 million gift to SIU’s James B. and Rosemary S. Childress Scholarship endowment. SIU Foundation officials estimate the fund will now generate about $80,000 annually that can be awarded to SIU business students. Engage with us on LinkedIn, Facebook, Twitter and Instagram. This entry was posted in Donor Stories, Higher Education, Illinois Higher Education, Scholarship Recipient, SIU by admin. Bookmark the permalink.